The multiworld bug should be fixed in version 1.1.1. At the moment it is possible for someone to create a teleport using the same material as someone else's, and therefore include their teleport in the other person's teleport system. This could be by accident, or on purpose! Could you change it so that the teleports are goverened by a sign on the frame, rather than the material? Yes you are right. It is possible to connect into someone else's gate network by using the same materials. It is part of the plugin design and I'd like to keep it that way. But can we have portal blocks for the teleport as the nether has been disabled in our server? - and it is !! I am very grateful to you for fixing this, it is much appreciated. Have a quick read of this post >>HERE<<. Hopefully it will assist. I have WorldEdit and Essentials on my server.. Does it make any difference? Essentials does have permissions built into it - read HERE please. CreativeGates does not have an inbuilt function to allow you to teleport to another world without a Creativegate already being there. You CAN however use another plugin like Xcraftgate available HERE Teleport to the Nether using this plugin (or similar plugin) set up a Creativegate, activate it, return to your normal world, set up the same gate and activate it. You will now be able to visit the Nether using Creativegates, and you can remove the plugin Xcraftgate because you wouldn't need it anymore. Of course, the curiosity is getting the better of me - why disable the Nether if you actually want to go there ? Another smaller problem with Creativegates - If you are near an active Creativegate and you drop a buckit of water near it and the water touches the water from the gate, when you pick up the water you first dropped, water is flowing out from the gate. The only way to stop this is to break the gate and recreate it again. As I say, its not going to happen often, and its not a major problem, more for information if anything could be done please ? Ahh - slightly different from what I thought you were after - however, I think if you read this post HERE - it will explain that the plugin author is not going to impliment nether portal material to be used. I wanted to make a 21 diameter portal but alas, it was "not found." Can you make it check for bigger portals? or at least add an option (for careful users) like -c to check for huge portals? Firstly, break the gates you've created, then recreate them - as you activate the gate, at the bottom of your minecraft window it will tell you what combination (or single) material you've used to create the gate. If you miss the words, you can always press whatever key you've assigned to open up the chat, and you will see what the gate is made of. Now create the second gate and make sure when you activate it that it shows its made of the same multiple (or single) material, and see that it also says 'Gates : 2' , now retry. If that doesn't work - Any chance of a screenshot of both gates please ? Im having the same problem too. Very cool plugin. Much simpler concept than other stargate plugins, which I like. Just wanted to make one request, regarding permissions. 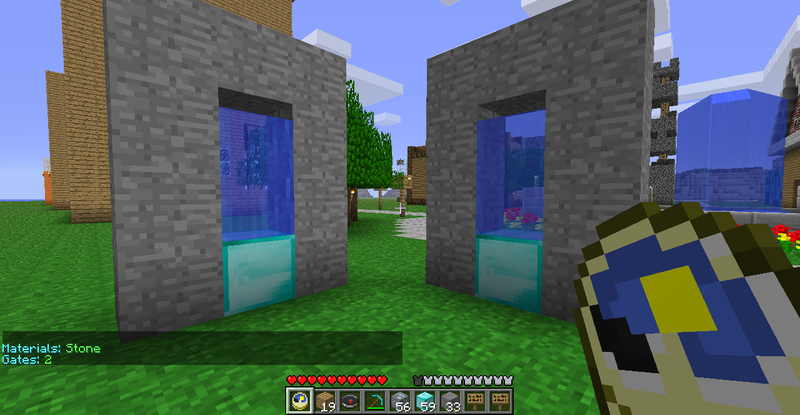 It'd be nice if it were possible to allow creation of gates by all players on the server for just teleporting about and such, but also for admins to make special linking gates between worlds. Then, travelling between worlds would be restricted to certain gates, only created by those with the admin permission nodes. However, this only works if gate types are restricted to certain permissions nodes, and if each type is restricted to accessing only certain worlds. I'd suggest allowing more than one "key" block to be used to create gates. For instance, diamond blocks for the usual sort, and bedrock for the admin-created ones, with separate permission nodes. Configuration of allowed worlds would still be necessary for each. Altogether, new config values "adminblock:", "worlds:", and "adminworlds:", or something like. You could even allow something more versatile, like pairs of "block#:" and "worlds#:", with only the #1 pair being mandatory, and associated permissions. (Even the first "worlds:" list could be optional, retaining the plugins basic-mode functionality) Hope that makes sense. Now, I have no idea how many others have a similar request.. Probably no one, heheh.. But, it'd be much appreciated, and thanks for the plugin regardless! OK, thanks for providing your bukkit version number, because of that I was able to recreate the problem. @Olof Larsson This post is only so that you are aware. It doesn't cause me a problem, since I'm staying on bukkit #910 at the moment, however, I tried your plugin on the new revommended build of #938 and my console gets spammed - see the attachment for details. The plugin still works and it doesn't appear to cause a problem so it was just to let you know. Not sure if you've had a chance to look at my post #79 in this thread yet please ? I tried this again, and next time, it was OK with bukkit #938, so I presume there was an issue with my config.txt file, although I'm not sure what it was ? Anyway, apologies for not triple-checking first. thanks. I updated to the new version and it works fine. I had meant to do this before to solve some other mods from acting weird. Again, thanks a lot. I am so on a learning curve here. I'm surprised I even got a server running in the first place heh. Every time i try to download the jar file it saves as a .zip what do i do? Its not in the .zip file either. I feel stupid asking this. Assuming you know how to 'reveal' the last 3 letters of a file - i.e. .zip, just rename it to .jar and it'll work. If for any reason it doesn't, I can presume you are currently using Internet Explorer to download it, try using Google Chrome or Firefox - that'll download it as a .jar. It's the security settings in IE that cause this issue. you got a small problem, when you have world edit and are using the super pickaxe ( // ) worldedit just deletes the block, and then spawns the item where the block was. it does not trigger your diamond destroyed trigger. worse still is if you delete the portal and only leave the bottom blocks behind. if you have a server reload. it tries to create a portal from what is there. (in my case it was a 20 block wide 8 block high portal.) (but that was before i knew about the way worldedit handles the block deletion...) so i suggest adding a 30 second check for your portals being checked for still being "intact"
i point this out as i know there are other "super block destroyer" type plugins. and it was pure luck that i turned the super pickaxe off. good luck. and i do love the plugin. Is it possible to make the portal look like a nether portal? I mean, use the portal material instead of water? I'm not sure the plugin author is keen on doing that - if you read this post HERE, it will explain why. Can you make it possible to change material in the config file? When I destroyed a gate it left the water and I am unable to remove the water. Olof, any chance you'll link iConomy with this as an option? At least, on gate creation. I was thinking it would be nice to charge the players a fee to 'ignite' a new gate. So far, the only people reporting that fault have been using a superpickaxe or similar supertool. They destroy blocks different to standard tools. I've destroyed only a handful of gates, but each one has destroyed properly, in fact, as soon as I take out 1 part of the frame, the water is gone instantly. Yes, I was using SuperPickAxe...thanks! My users have found an odd bug - same-material gates link to each other, doesn't matter what shape they are at all. Oh nevermind, that's how it works. Damn. Okay, i can work with this. What version of bukkit and my plugin are you using? Also please copy paste the error here please.